Becky Lin tops a cup of rolled ice cream. In front of a bright green wall, three servers are mixing and mashing small piles of semi-liquid ice cream with flat metal scrapers while customers eagerly wait. This is a typical scene at Yummy Ice Cream Rolls. The newly opened treat shop offers a fun, visual experience that lets customers see the process behind its chilly offerings, which are all made to order on round, steel ice plates that are continuously chilled at around 10 degrees below zero. Though Yummy Ice Cream Rolls essentially only serves one item — rolled ice cream — there are plenty of options to choose from. Customers can create a personalized flavor with their choice of toppings and sauces over a base ice cream like huckleberry, honeydew, matcha, latte, mango, strawberry, chocolate and many others. Or they can try one of the shop's specialty bowls, like the best-selling "Oreo's Secret" that consists of — you guessed it — Oreos and whipped cream, or "Monkey Business" with banana, swirled Nutella, caramel and a biscuit stick. There are also seasonal flavors with fresh fruit, like watermelon. All bowls are sold for a flat price of $6.95, with two free toppings for custom orders (extra goodies are 50 cents each). "There's nothing to hide. 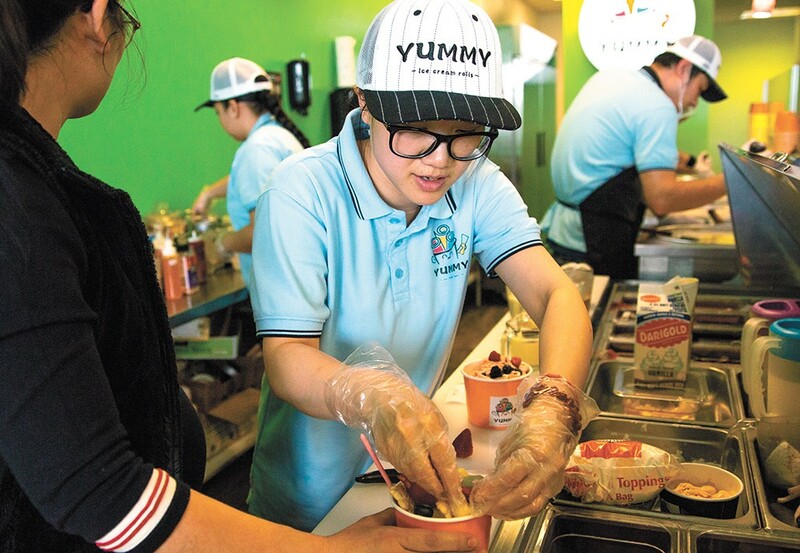 Everything is fresh made just for you — ice cream is made right in front of your eye," says co-owner Leo Zheng. "That's one of the things that brings people in, they want to see how we make it." The process of achieving the thin, almost crepe-like rolls of ice cream, also known as stir fry ice cream, originates in Thailand, where it's available as a common street food. The texture of the ice cream is contingent on controlling the ice plates' temperatures. If the plates aren't cold enough, the ice cream won't roll, but if they're too cold, the ice cream will be too hard to form into rolls. Customers can choose their own ingredients, or order one of the shop's speciality bowls. This new family business run by co-owners and distant cousins Zheng and Evan Ke has already been attracting buzz in Spokane. Zheng notes that the most surprising thing about opening the business is how many customers they've served already. They've received rush after rush, especially on weekends and times when most people are free from school and work. On a family vacation to Thailand three years ago, Zheng and Ke discovered their love for this cold treat. Upon coming back to the U.S., they were disappointed to find a lack of stir fry ice cream in Spokane, even though the dessert has gained recent popularity in many major U.S. cities. They began brainstorming and decided to fill the void. "He wanted to have the business," says Zheng with a smile referring to Ke. "I wanted to have the ice cream." Zheng and Ke, who've both lived in bigger cities for a time, appreciate the smaller city feel that Spokane offers. Zheng says that since Spokane is growing, it felt like a good place to start. Yummy Ice Cream Rolls already plans to expand with a second location in Spokane Valley in a few months. Both owners have a hands-on approach with the business. On a given day, customers might find Zheng walking over to their table, inquiring about whether they're enjoying their dessert and cracking a joke. Ke, a former hibachi chef, is often rolling the ice cream behind the counter. As for the shop's aesthetic, both owners were intentional with the effect they want the brightness of the space to have on people. The original print version of this article was headlined "Happiness Rolled Up"